The following article will provide knee anatomy information for patients and their families. 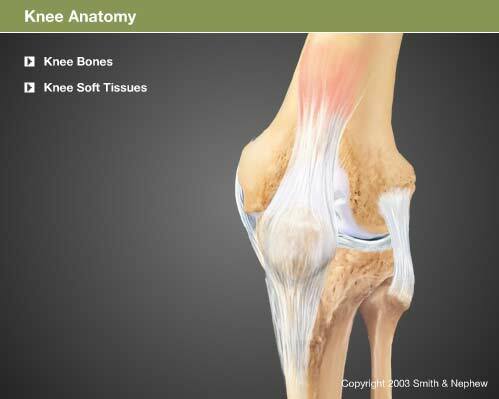 The largest joint in the body, the knee is also one of the most complex. The knee may be described as a modified hinge joint, similar to the hinge on a door. However, the knee not only bends back and forth like a hinge, it has a complex rotational component that occurs with flexion and extension of the knee. The knee is a major weight-bearing joint that is held together by muscles, ligaments, and other important soft tissue. Cartilage is the material inside the joint that provides shock absorption to the knee during weight-bearing activities such as walking or stair climbing. 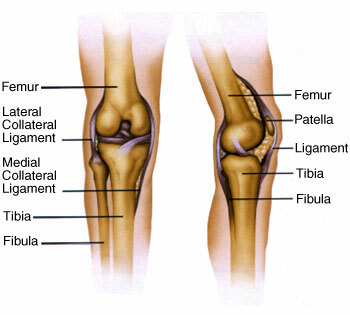 The bones of the knee are the femur (thigh bone), tibia (shin bone) and patella (kneecap). The femur and tibia meet to form a hinge with the patella in front of these two bones protecting the joint. The patella slides up and down in a groove in the femur (the femoral groove) as the knee is bent and straightened. Ligaments hold the knee together and give it stability. The medial (inner) collateral ligament (MCL) and outer (lateral) collateral ligament (LCL) limit sideways motion of the knee. The posterior and anterior cruciate ligaments (PCL and ACL) limit forward motion of the knee bones, keeping them stable. Two structures known as menisci sit between the femur and the tibia and act as cushions or shock absorbers for the knee. A torn meniscus is often referred to as “torn cartilage.” Menisci are one of two types of cartilage in the knee. The other type, articular cartilage, is a smooth and very slick material that covers the end of the femur, the femoral groove, the top of the tibia and the underside of the patella. This articular cartilage allows the bones to move smoothly. Tendons connect muscle to knee. The quadriceps muscles on the front of the thigh are connected to the top of the patella by the quadriceps tendon, which covers the patella and becomes the patellar tendon. The patellar tendon then attaches to the front of the tibia. The hamstring muscles in the back of the leg attach to the tibia at the back of the knee. The quadriceps muscles straighten the knee and the hamstring muscles bend the knee. Bones, ligaments, cartilage and tendons all work together to build a healthy knee. Click on the image below to view an interactive animation of knee anatomy.